This method requires four blanket pins (I use 2.5-inch pins). 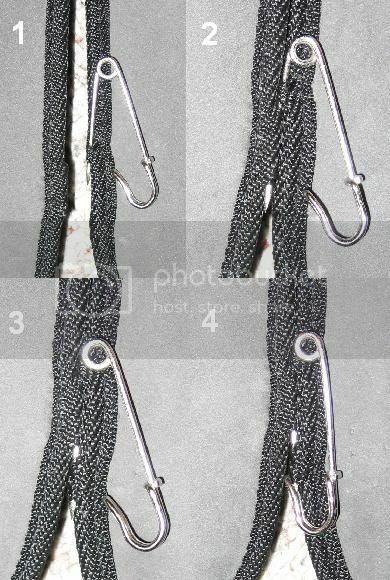 Blanket pins are essentially heavy-duty safety pins. They typically cost about 50 cents each. You may also find pliers to be helpful in closing the pins. To attach the pads, you will basically be clipping them together on the lower hem in four places, each with a pin. 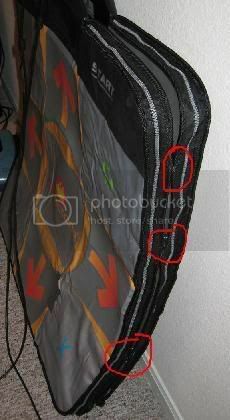 Here is a view of the bottom of the pads, with the location of each pin indicated by a red arrow. Pins 1 and 4 should be at the ends. Pins 2 and 3 should be about 9-12 inches from pins 1 and 4, respectively. You do not need to make the third penetration, but regardless, make sure to alternate which pad you start from, and which way the pin is pointing. Also, try to leave at least a quarter inch between where the pin punches in and where it comes out so as to avoid a Ã¢Â€Âœtear-outÃ¢Â€Â� failure. One advantage of this approach is that, since the pins are all along one line, you can easily fold it up for storage or transport, and you can indefinitely replace the pads while re-using the pins. See the picture below. Note how it also largely keeps the pad from sliding. I hope you found this helpful. Special thanks to my mom and dad, who devised this solution when I visited them.